How to Care for Tablecloths – This is the go-to source if you’re looking for specific washing instructions. 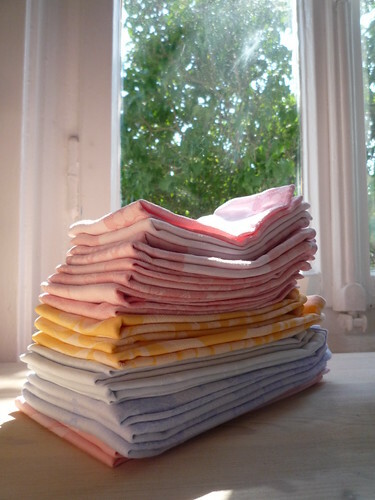 It also includes information for storing your tablecloths to avoid those square folding lines. Ironing instructions are also in this post. Since people tend to use cloth napkins and tablecloths during the holiday season, I’ve written several posts around that. Make sure you bookmark these and return to them in mid-late October. You’ll be so happy you already have the post bookmarked and can find it easily when you’re wondering how to remove that awful stain or how to prepare yourself for the holiday parties you’ll host. Caring for Tablecloths and Cloth Napkins – This post contains specific stain removal advice for tablecloths and napkins. If you’re battling a lasagna stain (tomato-based) and a red wine stain (tannin), well… it can get tricky. Make sure you know how to properly care for stains so you can use your table linens for years to come. Stain Removal Guide for the Holidays – If you’ve made it through your holiday meal without spilling anything on the tablecloth, I’d call that laundry success! 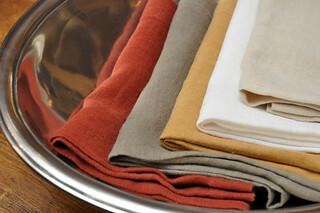 However, if you need detailed stain removal advice for your table linens this is what you should read. Jami from An Oregon Cottage writes on her dining room transformation before and after. Christine from I Dream of Clean gives tips on Cleaning Off the Dining Room Table. Taylor from Stain Removal 101 shares tips and tricks to make the job of cleaning silver seem a little easier. Dana from A Slob Comes Clean talks about keeping the dining room table under control. Perfect post for me. I have so many of my grandmother’s linens. I need to take everything out this fall and wash and give some extra attention to everything…. I have some nice, big square cotton napkins with mitred corners that I like to use for family dinners, but they’re so out-of-square now that I’m almost embarrassed to use them. This is most obvious when they’re folded: the corners just don’t line up any more. I’ve tried to iron them back to squareness, but it doesn’t work. Is there any way to square them up again? Lobelia, I know exactly of your problem, as I have a few cloth napkins that are in similar shape. I have not yet found a solution, but will certainly post here when I do!